The life and work of a soldier is physically demanding by any standard. 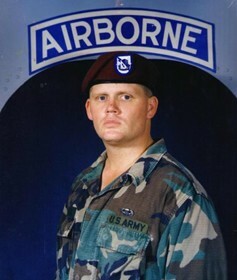 As a US Army Paratrooper I was expected to perform to even higher levels than the average soldier. More than just taking pride in my personal fitness, I defined myself by my physical abilities and athleticism. I derived most of my self worth from the fact that I could do more than the average person. That all changed in September of 1995. While stationed at Ft. Bragg, North Carolina the unthinkable happened. While on a routine training exercise I was run over by a 5 ton dump truck. The amount of damage to the right side of my body as well as my lower back was devastating. After several months of hospitalization at Womack Army hospital I was released back into civilian life a broken shell of what I once was. For more than a decade after the accident I battled to survive in spite of the physical limitations of my disability. Worse yet was the fight I had internally, battling feelings of depression and worthlessness because of my physical limitations, limitations that had robbed me of my dream career in law enforcement. For years I went from doctor to doctor, chiropractor to chiropractor, physical therapist to physical therapist trying to regain some part of the fitness and wellness I had once enjoyed. Try as I may, I could never find an adequate solution to my pain and loss of mobility. That all changed about a year ago when I became a patient of Dr. Kerendian. Dr. Kerendian helped start my recovery first by treating my joint pain with a treatment known as Prolotherapy. This solution activates the body’s own healing mechanisms and motivates the healing of tissues that don’t typically heal themselves. Almost immediately after beginning this therapy I was able to walk without significant pain and saw a gradual return of some of my lost mobility and flexibility. In addition to Prolotherapy, Dr. Kerendian started me on a treatment plan for several hormonal and chemical imbalances that were hindering my body’s ability to heal itself. These treatments not only helped to accelerate my healing but helped to improve my overall state of well being. Since I have been a patient of Dr. Kerendian, I have seen an amazing change in my health and wellness. I used to wake up every morning in a world of pain and despair, a world where I could barely walk up a flight of stairs without holding a rail for support. Now I wake up with a significant reduction in pain, a renewed quality of life, and a hope of an even better tomorrow. Within the last 10 months I have been able to start running again for the first time in over 14 years. I’ve even renewed my dreams of a career in law enforcement. In mid 2008 I started attending an extended format police academy at a local community college, and even though it is a painful challenge trying to keep up with younger, healthier people, I am surviving and, better yet, succeeding! I could not have come this far if it wasn’t for the expert care given to me by Dr. Kerendian. Thanks to Dr. Kerendian I have a new lease on life. Beyond that, I now have the quality of life that I had when I was a younger stronger man. That quality of life has opened doors for me that I thought had been closed forever.